Beautiful Anchor Stranded Cotton in 6 Strands for all your embroidery projects. It is a superior, six strand 100% long staple mercerized cotton embroidery thread on 8m skeins. Anchor Stranded Cotton is manufactured by Coats Crafts UK, a company founded some 200 years ago, and is very popular with cross stitchers. There are now several hundred different color shades within the Anchor range. Available in 484 colors, including ombré and Multicolors, Anchor Stranded Cotton is the most versatile embroidery thread and can be used for freestyle and counted thread embroidery and is particularly popular for Cross Stitch. Anchor uses the world’s finest long staple cotton and mercerise it twice which gives your embroidery an exceptional sheen. Made from high grade and excellent cotton material, it offers a comfortable texture and a delightful feel to your projects. Anchor Stranded cotton comprises of 6 easily divisible strands which allows you to vary your stitching results to add depth to your project. 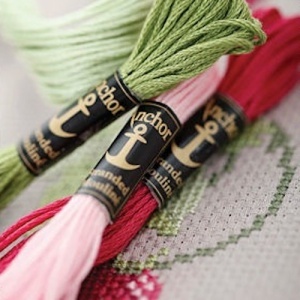 Anchor is one of the premier brand names in needlework threads and the stranded cotton threads are exceptional in quality and available in 484 of colors. It is recommended that you purchase enough thread at the beginning of your project to ensure that there is no variation in color of the finished article. If you have been thinking about trying your hand at Cross Stitch, please click HERE to see how easy Counted Cross Stitch can be. However, please note that is imperative to complete your piece of cross stitch work using thread or floss from the same manufacturer to ensure that there is no variation in color of the finished article.